Every night before bed, my daughter, Millie, likes to hear us read a few books. What she knows is that she loves being read to. What she knows is that she loves hearing us do the funny voices of her book characters. What she knows is that reading helps her make that difficult transition from being awake to falling asleep. What she doesn’t know is how carefully we have chosen those books that we read. What she doesn’t know is how many hours we have spent online selecting the perfect books for her to have in her bedroom library. What she doesn’t know is that if we had just gone to an average bookstore to get books for her, she very well might not ever see herself or her family reflected in those books. Because Millie doesn’t have one mom and one dad like many of the characters that fill the pages of children’s books. Millie has two moms. So from the moment my wife and I began the adoption process, we began looking for books that would allow our one-day child to see herself reflected in them. It was important for us that she grew up knowing that her family was not weird or strange, but just one kind of family amongst all the different kind of families that are out there in this world. And the best way that we knew to do that from the earliest of ages was to make sure that the books we read to her allowed her to see herself in their pages. 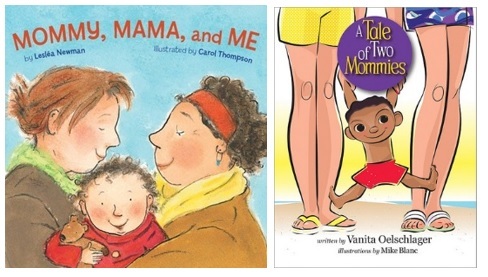 So we made sure to buy books like Mommy, Mama and Me by Lesléa Newman and A Tale of Two Mommies by Vanita Oelschlager. And once we brought our Millie home, these books became some of her early favorites. Not only was it important for us that Millie see herself in the books that we read, but it was important for us that she see others in her books as well. It would be silly to have her grow up only seeing families that looked like her own in the books that we read together. What kind of an image of the world would this give her? So we also made sure to have books like The Great Big Book of Families by Mary Hoffman and The Family Book by Todd Parr and Everywhere Babies by Susan Meyers. These books would help us to teach our daughter that the world contains many different kinds of families and they are all filled with the same kind of love that our family is filled with. We wanted her to meet all sorts of families by falling in love with them in her books first. That way, when she encountered different types of families out in the real world, she would not judge or act surprised because she would already know families like those from the stories that she had read since she was young. By seeing herself in the books that she reads, Millie begins to see that she has a place in this world. By seeing others in the books that she reads, Millie also begins to see that everyone has a place in this world. This thinking has extended from my own home right into my classroom. As I redid my classroom library at the start of this school year, I was consumed with thoughts of how my students would see themselves in the books that lined my shelves and how they would see others in those books. As I went through each title in my classroom library, I realized how few of my realistic fiction books took place outside of the United States, I realized how few of my sports fiction books had female main characters and I realized how few of my books outside of my historical fiction books contained main characters of color. I realized that just like I fought to ensure that my own daughter would see herself reflected in her books, I had to also fight to ensure that each of my students had that same chance with the books in my classroom library. I wanted each child in my room to find themselves reflected in the books in my classroom. I wanted them to connect to characters that were like them. I wanted them to feel worthy. I wanted them to know that they had a place in this world. And I wanted them to learn to see others through the books in my classroom as well. I wanted them to read about children and root for children whose lives were vastly different than their own. I wanted them to know the stories of those growing up in different countries, in different circumstances, in different skin colors, in different cultures and in different lives. I wanted them to learn to connect to these characters too. I wanted them to build empathy for others. I wanted them to see the value of all human beings by learning their stories and by falling in love with the characters in their books. To do this, I needed to do the same kind of research for my classroom library that I had done for my daughter’s bedroom library. And so I went online and I found the books that I needed. I bought Better Nate than Ever by Tim Federle so that a boy who loves musical theater might see himself reflected in the pages of a book in my library. 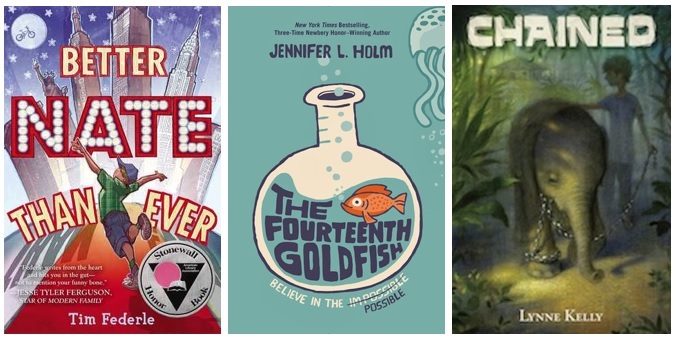 I bought The Fourteenth Goldfish by Jennifer L. Holm so that a girl who loves science and experiments might see herself reflected in the pages of a book in my library. I bought Chained by Lynne Kelly so that my students might see into the life of a child living in another country through the pages of a book in my library. These books and many others have begun to create a classroom library that is better filled with books that will act as both mirrors and windows for every child in my classroom, reflecting themselves and their own lives and also allowing them to see into the lives of others. Sometimes, in this world, it is easy to feel powerless against unkindness. It is easy to feel as if there is nothing we can do to ensure that our children grow up to be respected for who they are and to respect others for who they are. But we cannot give in to those feelings of powerlessness, not when we have books at our disposal. I have chosen to arm my own child with stories like hers and the stories of others. I have chosen to send her into this sometimes unkind world armed with her books so that she can take solace in them when she needs to. And I am working to make that same choice for my students. Because every single child that walks through my classroom door deserves to see himself or herself in a book in my library. And every single child that walks through my classroom door deserves a chance to learn about others in this world from the books in my library. It is what I want for my own child and so it is what I want for my students as well. How I wish I could give The Fourteenth Goldfish to the younger version of myself. Great post, Jess! Windows and mirrors, yes. Every child who. Beautiful, Jess. I am glad to know that people like you are thoughtfully parenting and teaching the current generation of young people! I spent many hours searching for and reading books I thought my students could relate to and identify with! So glad to see I wasn’t the only one to do this….and I was a middle school math teacher! I am retired now, but I continue to share all kinds of books with my granddaughters. It warms my heart that they don’t understand why some people don’t accept people of different heritages or families that are different than theirs. The accept that all of our differences are what make life so much more interesting, and so much fun! This beautifully articulates what so many of us are trying to offer our students. Thank you!